When Abhinav Singh, a young Noida based entrepreneur, decided to build a house for his extended family he decided he wouldn’t settle for anything but the best. He located a good architect on the Internet and as the house was being planned, he identified sources for the best of materials starting from pressed bricks to fine marble. When it came to wood, there was no choice really; it had to be Teak, a wood venerated by Indians for its durability, insect resistance and workability. The design of the house required long straight pieces of timber for eight feet high doors and French windows. He also wanted Teak for flooring some of the rooms. When it came to sourcing the wood, Abhinav did not rely on local lumber yards. Instead he went back to the Internet to research the source of Indian Teak. His search ultimately led him to the forests of Madhya Pradesh, which during British times was part of the then Central Provinces. CP or “Central Province” Teak is considered among the best Teak in the world primarily because most of this wood is harvested from slow growth forests of the hot and arid central region of the country. Teak trees in these parts grow slowly, are dense and have thin growth rings. This makes the timber extremely strong and stable. Good CP Teak, it is said, will not twist, bow or cup once it has been dried and sawn. 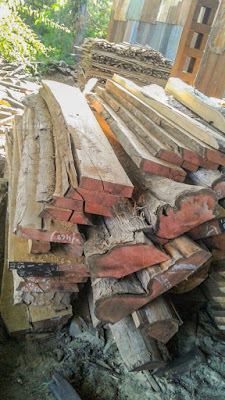 The notorious termites of Noida will fail to bite and the scorching north Indian sun will not be able to entirely dry the natural oils in the wood. Armed with this certainty, Abhinav journeyed to the heart of Madhya Pradesh where he located entire trees felled and seasoned by the state forest department. 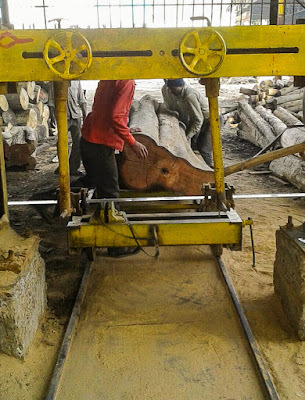 The felling, sale and transportation of Teak and many other species of wood is strictly controlled in India these days. These measures were brought into force largely to counter the large scale plunder of forests that had begun in colonial times. The British colonialists had begun the process of stripping the thick virgin forests that once covered most parts of India beginning from the late 18th century. The Napoleonic Wars in Europe and the shortage of English Oak for naval ships led to the use of Indian Teak for British shipbuilding. Teak turned out to be far superior to Oak and lasted almost indefinitely if cared for. 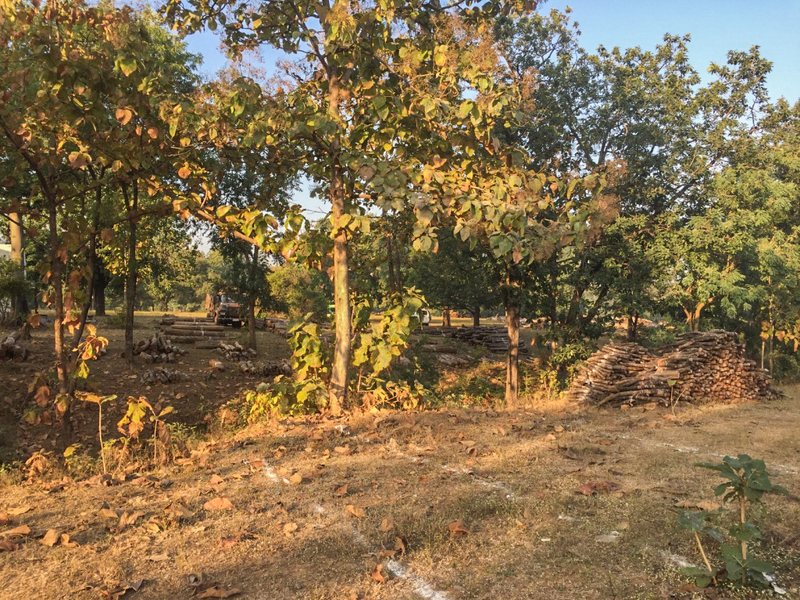 The British authorities in India therefore began a programme to systematically harvest Teak and other varieties of timber. 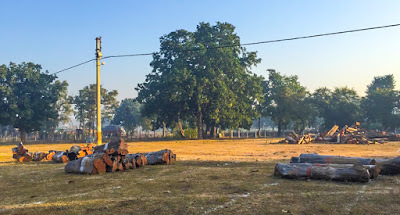 The growth of the railways and its insatiable need for wooden sleepers started a process of forest denudation that continued even after Independence. Today, the felling and sale of trees in India’s protected forests is strictly controlled and illegal trading in timber is a criminal offence punishable by many years in prison. 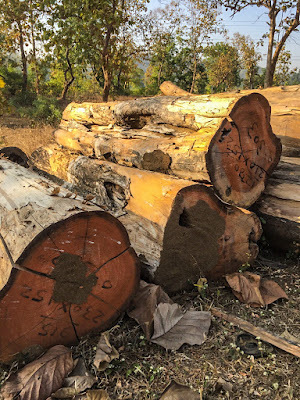 Forests trees are felled, seasoned and auctioned only by the forest departments of various state governments. Permits issued by the forest authorities are required for the transportation of the wood. Any ordinary person would have been daunted by the complexity of sourcing wood from the forests of central India but not Abhinav. He located forests and bought a whole lot of Teak at a government auction at a place called Bhoura. With the help of a local timber merchant, he took the logs to Bhopal where they were sawn and milled to size. 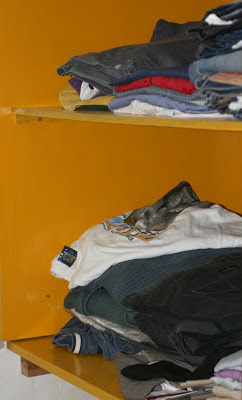 These were eventually shipped to Noida along with the requisite permits, forms and what have you. Abhinav’s extraordinary perseverance has paid off; his house will boast of some of the finest CP teak available in the country. I stumbled upon your blog accidentally and I am glad I did. Rarely we see so much passion about woodworking in Indian DIYers. I did have a question: Do the Metric bits fit in a SAE Power tools? i.e. if I buy a impact driver from US, can i use bits from India? 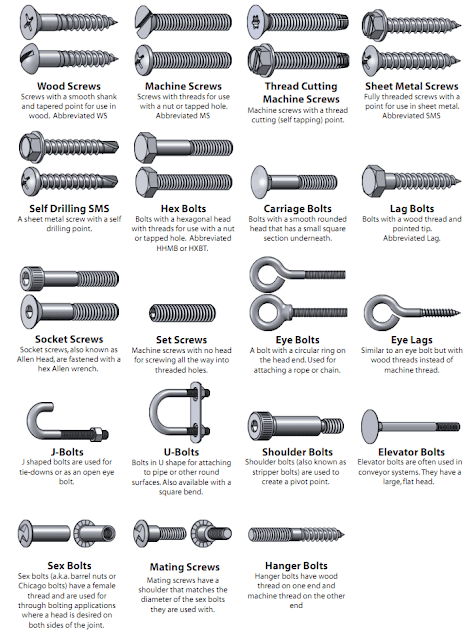 US power tools usually use the imperial system ie. inches and feet whereas we in India use the metric system. The two systems do not match. However, you can get imperial size bits in India. Also, impact drivers usually can take any bit size whether imperial or metric provided it is within a certain diametre. In your opinion, If someone has access to good quality power tools from the US, is it worth it to purchase them for India? With all the differences in measuring system, voltage, etc. Amreesh, I would rather buy corded power tools from India or Europe where the electricity standards are similar to here. However, it would be cheaper to buy cordless power tools in the US and get a charger appropriate for India.